David Rosenberg, the Chief Economist for Glufkin-Sheff, frequently publishes his favorite recession indicators. Many of the below indicators are taken from his list, although some of them have been modified. If you ever get a chance to read his newsletter, I recommend that you do so. His writing is understandable and cogent to the regular investor, while still being well-fortified in economic history and fact. I track many of his leading economic indicators on a monthly basis. Below is a list of seven indicators that have an accurate track record of predicting recessions. The yield curve offers one of the most effective leading indicators in terms of predicting recession. This makes sense since bank borrowing is based on short-term lending rates, and bank lending is longer- term. As the spread shrinks, Net Interest Margins fall, and lending is curtailed. 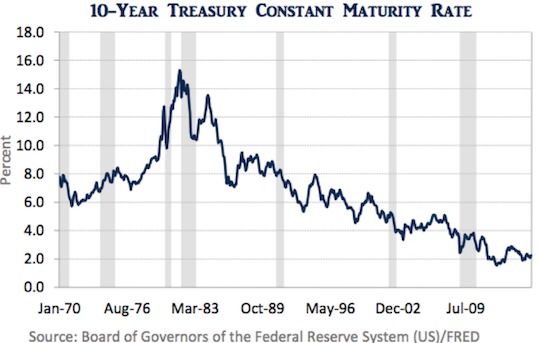 Prior to every recession over the past century, the yield curve has inverted, meaning short-term rates were higher than longer- term rates. The chart below illustrates this point. Typically, the United States economy falls into recession between 8 months and 1.5 years after the two-ten spread turns negative. By the time recession hits, this spread is usually positive since the market has already priced in a recession (the Fed has started lowering rates or is expected to lower rates). Nevertheless, there has been no recession on record that has occurred without an inverted yield curve. Typically, the year-over-year percentage change of the index drops below zero approximately six months prior to a recession. 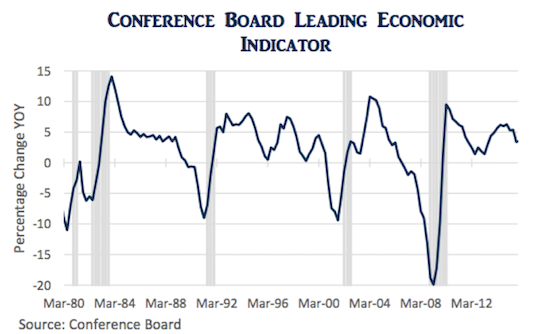 Within three months of a recession, the indicator is at -1% and by the time the recession officially begins, the indicator is less than -3%. High Yield spreads are also an effective leading indicator. They generally widen prior-to and during the initial phases of a recession. 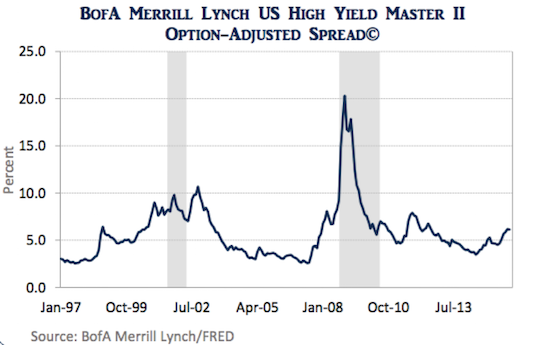 Leading up to the recession in 2001, high yield spreads increased 350 bps from their lows. Prior to the Great Recession they widened 560 bps, and then spiked to over 2000 bps during the recession. The data here is a bit scant since the High Yield spread index has only been available during the last two recessions. Since the consumer accounts for at least two-thirds of GDP, it makes sense that consumer sentiment is a valuable leading economic indicator. 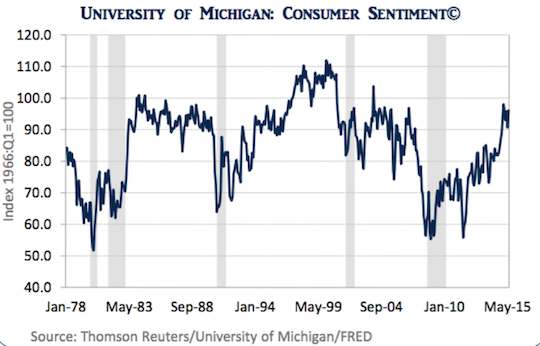 Prior to four out of the last five recessions, the Michigan Consumer Sentiment Index has dropped at least 20 points. The recession in 1981 saw the index only drop marginally, but consumer sentiment was already depressed from the prior recession. Initial Jobless claims tend to be very cyclical and a good indicator of recession. 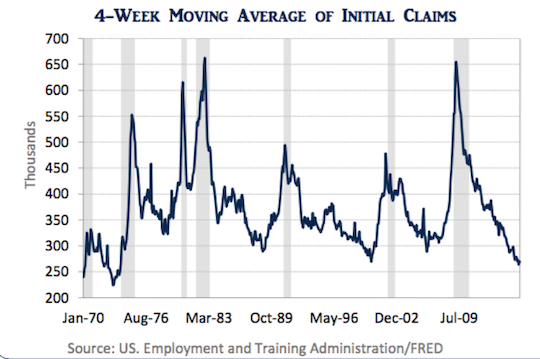 When the four-week moving average of claims spikes at least 70k off of its recent lows, the U.S. economy falls into recession. There have been numerous spikes between 20k and 60k, but they typically occur below the 400k threshold. The 1974 recession saw a much smaller spike leading up to the recession, however, total workforce population was much smaller than it is today. As a rule of thumb, the 70k threshold is highly predictive, and if that spike is concurrent with absolute levels above 400k, a recession is very likely. Manufacturing, over the last 30 years, has made up a declining percentage of GDP. Domestic consumption of goods makes up only 26% of GDP (in contrast to services which are now 42%). As a result, this indicator has less bearing than it once did. 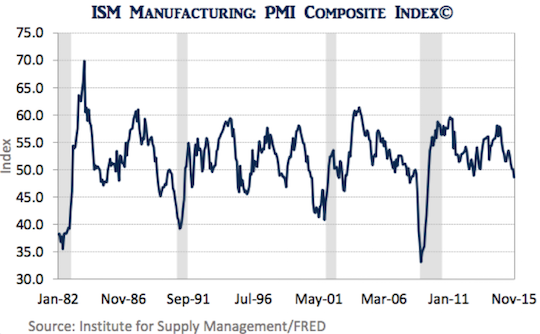 Still, an index reading below 50, which indicates that the manufacturing sector is contracting, should be taken as a warning sign that a recession is imminent. There have been a number of false signals over the past thirty years as evidenced by the chart below, nevertheless, it is an important survey. Safe-haven assets generally rally prior to a recession, and as such, are also a predictive leading economic indicator for the economy. Prior to the last three recessions, the ten-year yield as declined at least 100 bps from its recent highs. However, the three recessions prior-to 1990 saw increasing yields prior-to recession. This general rule seems to work well in a disinflationary environment. However, in an environment where inflationary expectations are more ingrained in investor psyche, this indicator will likely fail. Based on these indicators, the U.S. has very little risk of going into recession over the next twelve months. 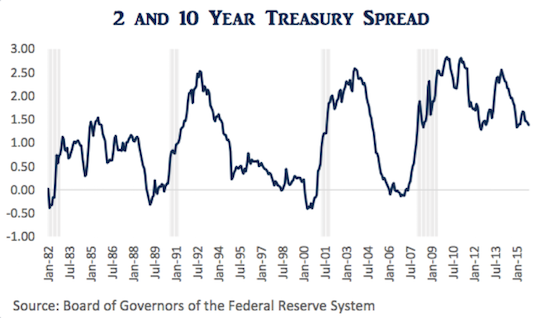 Inverted Yield Curve – Although the yield curve has been flattening for the better portion of the last year, the spread between 10 and 2 year treasuries is still 140 bps, well above its historical average and nowhere close to inverted. High Yield Spreads Widen at least 350 basis points— High Yield spreads have widened since 2014 by about 260 bps, due mostly to the commodity slump. However, this is still within the range that has historically represented a good buying opportunity (most recently 2011), and not severe enough to indicate recession. Michigan Consumer Sentiment drops at least 20 points from its highs—While not at its highs, the Index is only 7 points below its high registered in January 2015. ISM Index below 50—This index recently dipped below 50, registering a 48.6 in November 2015, and bears watching. 10 Year Treasury Yield Rallies over 100 basis points—The ten-year treasury is about 80 bps off its high water mark at the beginning of 2014 mostly due to global (not U.S.) growth concerns.